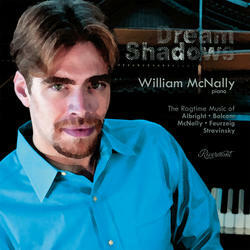 On this, his second CD for Rivermont, pianist William McNally performs classically-influenced ragtime works by William Albright, William Bolcom, Igor Stravinsky, David Feurzeig, and William McNally. Each of the works on this recording is a unique essay on how ragtime could potentially be defined. Bolcom's ever popular "Graceful Ghost" and Albright's "Morning Reveries" are richly textured works of exquisite beauty while Stravinsky's more abstract forays into ragtime reveal the influence of musical cubism. (And Feurzeig's "Stride Rite" adapts Stravinsky's "Rite of Spring" to a stride piano setting!) 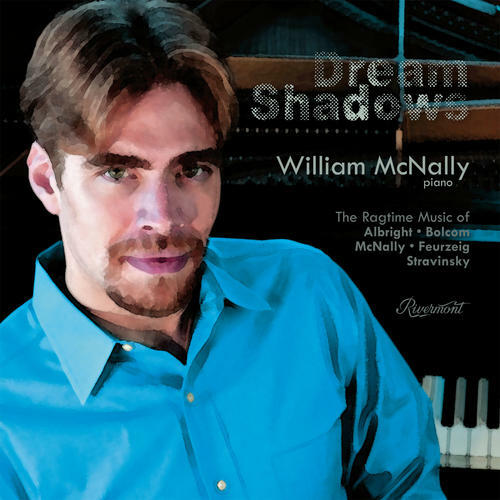 On the playful side, McNally's own whimsical "Mocha Monkey" perfectly captures the syncopated swing of an imagined ragtime jungle. These are intricate compositions and performances brimming with vitality and genuine emotion to savor over and over again. Includes a 20-page illustrated booklet with extensive commentary by the artist. 12 selections, 57 minutes.